This is quite sad. Two buses which was conveying Madonna university students from Jalingo to school, was involved in a ghastly accident along Abakaliki Road, Ebonyi state. 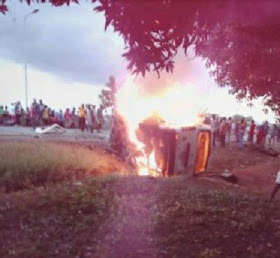 One of the buses conveying the Madonna university students got burnt in the accident, with the three students inside. The unfortunate incident occurred on Friday, November 2nd, 2018. The students who died in the accident have been identified Kerry Oliver (200L), Christable (200L, OPT) and Rita (200L, OPT), while those rushed to the hospital were identified as Stanley (400L, MLS), Chidima Nwosu (200L, OPT), Divine (100L, EE). 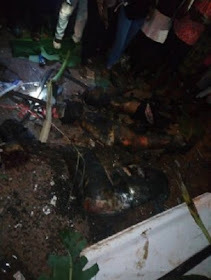 “One of my buses we chattered from Taraba state, containing only Madonna students (we chartered 2 buses) had an accident today around 6:PM, the bus somersaulted and caught fire immediately, the bus burnt beyond recognition, student were burnt inside the bus alive. 3 students were burnt to death beyond recognition (2 girls, 1 boy), 3 students managed to come out, but 1 broke her leg and head. They were immediately rushed to the hospital (and they are all unconscious). The buses contained 12 students (6 students in each bus, containing the driver, 7 people). It all happened in Ebonyi State, Abakiliki. (I don’t know the state of the driver, whether he survived or not). Next article El-Rufai picks Muslim woman as running mate? El-Rufai picks Muslim woman as running mate?